IHOP wooed customers with a pizza-pancake mashup. On National Pizza Day, an unexpected brand managed to hijack media coverage and social media chatter. 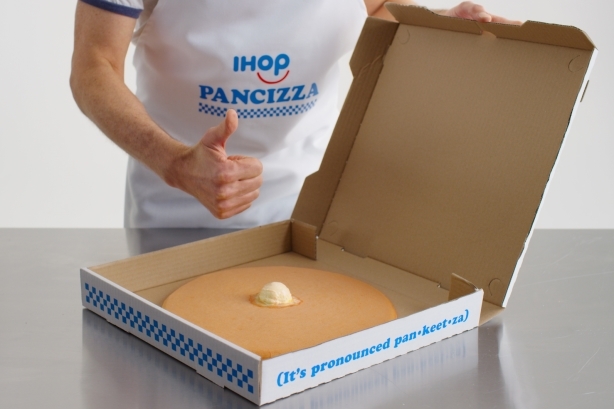 IHOP created a pancake served and eaten like a pizza – or a "Pancizza" – available for delivery in New York, Chicago, Los Angeles, and Dallas. What foods come to mind when you think of delivery? If you’re like most Americans, pizza probably ranks high on the list. "The goal of Pancizza was to highlight our delivery partnerships and to-go business," said Stephanie Peterson, head of communications at IHOP. To celebrate National Pizza Day, IHOP, the chain, known primarily for its breakfast foods, dreamed up a pancake-themed riff on the iconic cheesy pie. "We saw this moment as a great opportunity to insert IHOP into a conversation that we typically wouldn’t be in - in a very fun and unexpected way - and bring awareness to the fact that folks can get the IHOP food they love delivered," Peterson said. On February 8, a day ahead of National Pizza Day, IHOP released the Pancizza into the world. The invention came in three flavors – bacon and cheddar, original, and cupcake ­­– and was served in blue and white pizza boxes. The $4.99 Pancizza was available for delivery via the company’s IHOP ‘N Go platform and its partnership with DoorDash, from February 8-10. In addition to making Pancizzas available for delivery, IHOP took over the iconic Bleecker Street Pizza in New York City. From 11 a.m. to 11 p.m. on February 9, IHOP handed out free slices of Pancizza to passers-by. To amplify the campaign, the company offered a limited-time promotion in which consumers could get free delivery on any IHOP ‘N Go order of $10 or more placed through DoorDash. Droga5, IHOP’s creative agency, created a short Pancizza-themed YouTube video, which was released on social media on February 7, and boosted through paid support. The brand also sold Pancizza T-shirts. The campaign attracted an avalanche of interest from the media, generating more than 400 earned stories, including coverage from the "Today" show, "Good Morning America," USA Today, and People. It also performed well on social. The Droga5 social film was viewed more than 650,000 times across social media, and racked up more than 3,500 mentions. The Pancizza effectively highlighted IHOP’s takeout and delivery features. During the campaign period, the company saw a nearly 20% lift in total IHOP ‘N Go orders, and a 35% increase in IHOP orders made on DoorDash. This was an indication the campaign achieved its goal, Peterson said. "We wanted to let guests know they can get the same quality menu items they love, both inside and outside our restaurants," she explained.